Ancient Karate practitioners do not always bounce at Karate tournaments but why do today Karate practitioners bounce so much? 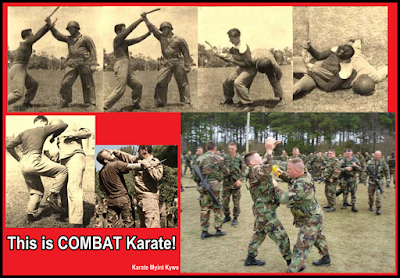 Today Combat Karate is popular martial arts of U.S. Army How about future of Karate! What is the future of my beloved Karate? 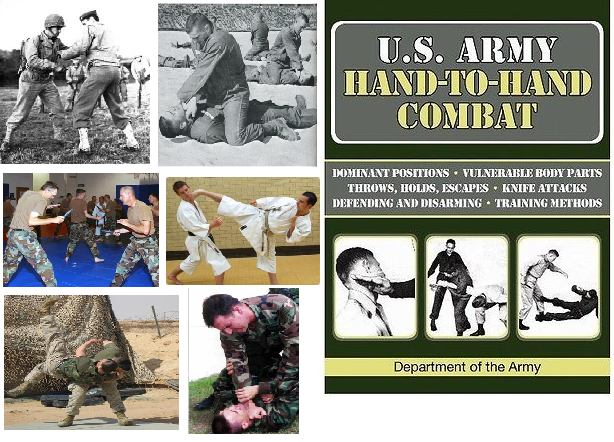 Combative courses have been taught by the United States Military Academy for its entire history. Military martial arts systems are fighting martial arts styles developed for real-life combat. They focus on areas such as self-defense, grappling and weapons training. Counter-attack or surrender!!! , do or die!!! , alive or dead!!! Your life, dignity, soul, nationality and country in depend on your skills in karate!!! The program develops confidence not only in individual Marine combat skills, Bristol said, "but also in the skills of your fellow Marines," because battlefield combat requires teamwork. Marines who learn lethal combat skills are expected -- and required -- to use them responsibly, he said. "The program teaches the ability to kill, but it is also tightly balanced with ethics," Bristol said, as part of the Corps' definition of a warrior. "A Marine (is) highly skilled in lethal technique who can function appropriately in any environment. That includes the battlefield to his or her place as a citizen in society," he said. Master demonstrates how to defend yourself against an attacker larger and heavier than yourself by applying the principles of vital point striking. Cause your attacker some pain by attacking those weak human body areas. IMPORTANT: Please use extreme caution when practicing these moves. Remember that with the right amount of force, you can severely hurt somebody. These techniques are to be used for self-defense purposes only. All self-defense moves and tips are to be used at the risk of the user. In street survival, it is important how quickly you react in a situation. This picture will teach you how to do the striking technique for self-defense. The striking method is demonstrated in this video so that you will avoid being a victim of the streets. These are commonly known as pressure points. The points include the eyes, the groin, the shins, etc. Pressure points are areas on the body that are vulnerable to attack or manipulation. In these areas nerves cross with one another to go in separate directions. Manipulating a pressure point sends a signal to the brain that affects the entire body. While all points are vital, attacking some pressure points can be deadly. Martial artists can use this reflex with minimal effort. Army recruits en route to become infantrymen at Fort Benning, Ga., get 15 hours of hand-to-hand combat instruction over 14 weeks as part of the infantry's One Station Unit Training program, said installation spokesperson Elsie Jackson. Troops attending the post's elite Ranger School receive an additional 18 hours of hand-to-hand combative training, including boxing, she added. Army Special Forces students at Fort Bragg, N.C., receive extensive hand-to-hand combat training, said Carol P. Darby, spokesperson for U.S. Army Special Operations Command at Fort Bragg. "Over a period of about one year, students in the Special Forces qualification course receive about 30 to 40 hours of combative training," Darby said. This training, she added, begins with basic hand-to-hand moves and advances as students progress through the qualification course. After troops graduate from initial Special Forces training and are assigned to their operational groups, they undergo more specialized hand-to-hand combative training, tailored to the mission needs of each unit, said Maj. Jonathan B. Withington, spokesman for U.S. Army Special Forces Command at Fort Bragg. The Navy and Air Force also provide hand-to-hand and martial arts training, but normally only for members of special operations and law enforcement units. Air Force and Navy recruits don't receive bayonet or hand-to-hand combat training, according to service officials. Most of these specialized martial arts programs been developed by countries with large militaries such as the United States, Russia, China, Japan, Korea, and Israel. 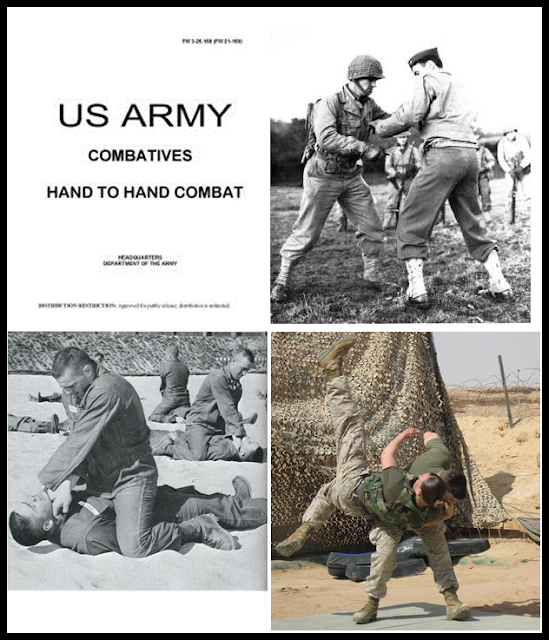 Military organizations have always taught some sort of unarmed combat for conditioning and as a supplement to armed combat. Close combat using firearms or other distance weapons by military combatants at the tactical level is modernly referred to as close quarter battle. The U.S. Army uses the term combative to describe various military fighting systems used in hand-to-hand combat training, systems which may include modern eclectic style techniques from several different martial arts and combat sports. Close Quarter Combat (CQC) training involves using basic, natural movement to overcome larger and better armed adversaries. This course allows for a minimal amount of training with maximum results. CQC training begins with rifles, pistols, knives, ropes, and then moves to the most advanced fighting--unarmed fighting. The objective is to insure that the student can survive zero-sum (life or death) conflicts using improvised weapons. Soldiers of China were trained in unarmed combat as early as the Yellow Emperor (2600 BCE). Chinese martial arts is the most oldest of all martial arts and it is possible to trace its roots back more than 4,600 years. The earliest form of Chinese martial arts is those practised by soldiers for direct use in battlefield combat. Ancient legend states that weapons and hand-to-hand martial arts’ techniques were propagated by China’s Yellow Emperor. Before he rose to the imperial throne in 2698 BC, the Yellow Emperor had been a notable general and had already written at length on elevated subjects such as astrology, Chinese medicine and the Martial Arts. 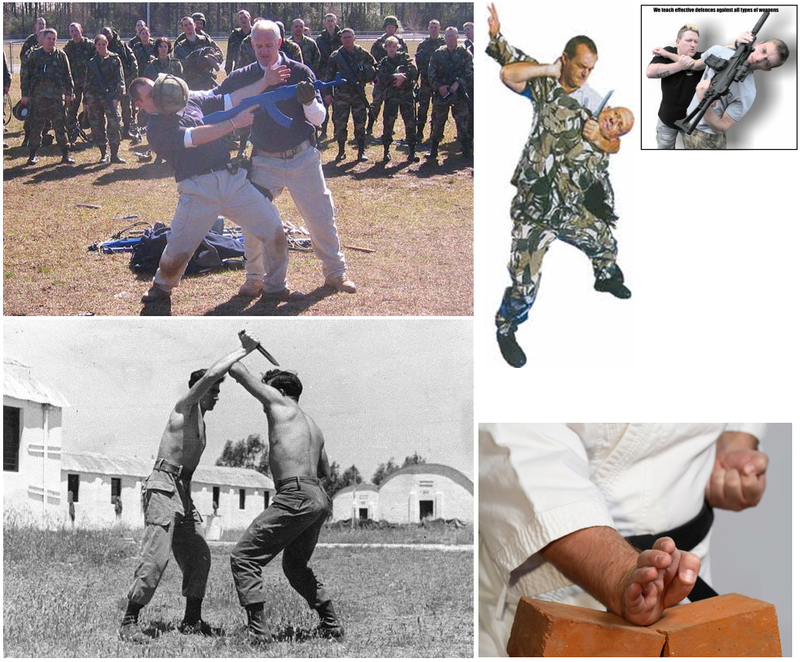 Most militaries teach some form of unarmed combat but often it is a form of mixed martial arts where military personnel might learn a combination of martial arts techniques such as Karate kicks, Jujitsu techniques, basic self-defense against weapons, etc. Just over 10 years ago, the military made it mandatory for every soldier to learn Karate (Asian martial arts). As the military tends to be more active in peacekeeping missions than traditional warfare, soldiers are told to learn martial arts so they will have the skills to restrain civilians and build confidence in the army. To enhance the army’s reputation among civilians, it is necessary for soldiers not to overreact when faced with a hostile situation. COMBAT Karate (Unarmed martial arts) is a popular Japanese martial arts style that was originally developed on the islands of Okinawa. It focuses on punches, elbow strikes, knee strikes, kicks and weapons training that focus on joint locks, holds, takedown (grappling), and throws. It tries to redirect or manipulate the force of an attack in order to defeat the attacker. In martial arts and combat sports, a takedown is a technique that involves off-balancing an opponent and bringing him or her to the ground, typically with the attacker landing on top. Love is better than fighting but fighting is better than surrender. Karate begins and ends with courtesty, humility, and mutual respecty.